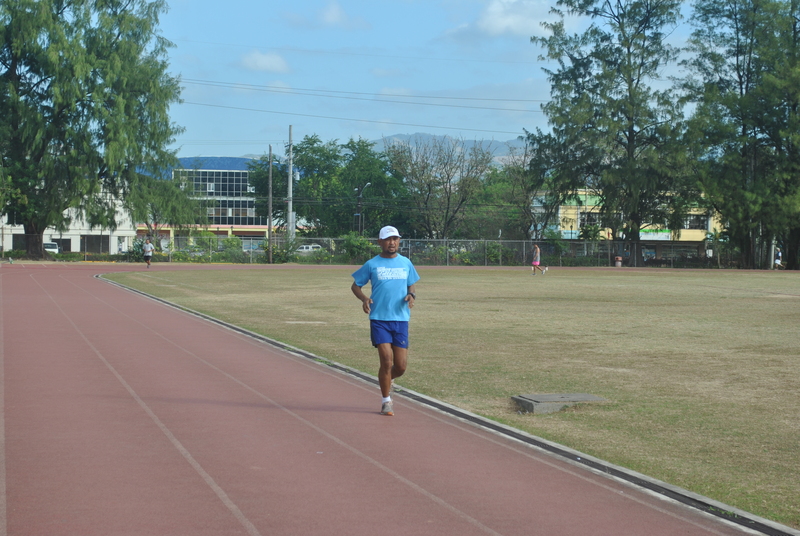 I remember those days when I was doing my speed training in preparation for my half-marathon & marathon races in 2009. I had a structured training program which was supervised by two running coaches of the Elite Team Bald Runner. Before I was given a speed training program, I was asked by my running coaches to have an evaluation run first. The evaluation run was done on an oval track. I was made to run on the oval track for thirty (30) minutes with my best effort and from the result of the distance I could cover, my coach would be able to determine my target pace for an intense interval training, threshold/tempo run, and easy run in order to make me run faster in a marathon race. Last Monday, January 6, I did exactly what I did 4 years ago with the purpose of developing more lifts and number of cadence to my knees and feet. I started my run at 8:00 AM when the sun was already high above the horizon. The weather was cool with a moderate strong cold breeze coming from the west which is the location of the sea. I used the lightest shoe from my arsenal of trail shoes, the Helios of La Sportiva. And running outfit were my regular running shirt and Adidas Running Shorts. Without much fast runners on the oval track, I positioned myself on the most inner lane of the oval track. I finished my first lap in 2:10 minutes; second lap in 4:11 minutes; and after 4 laps (one mile/1,600 meters), I clocked a time of 8:43 minutes! Not bad! I started to slow down after I finished 10 laps and fought the need to hydrate myself. At exactly 30 minutes of running, I was able to run 13 laps and 300 meters. I had to walk for another lap for my rest and recovery. 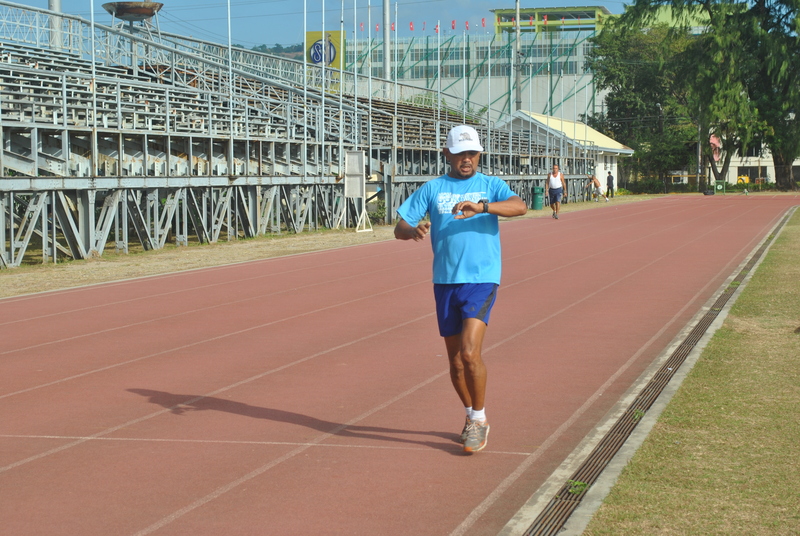 The total distance that I was able to cover within 30 minutes was 5,500 meters or 5.5 kilometers. My Average Pace was 5:27 minutes per kilometer. Four years ago, I could run 15 laps plus some change/extra meters. My older age (plus 4 years) had greatly diminished my speed/average pace plus the fact that I’ve concentrated so much in my ultra distance runs and trail running. It is my plan now to make myself to run faster this time by using the result of my evaluation run. There is a need to incorporate more interval speed training and tempo runs in my ultra trail running. In the meantime, I will have to visit the oval track once a week and do my tempo runs on the trails of my playground. I hope I would be able to lower down my average pace to 5:10 minutes per kilometer in 4 weeks! Of course, I would also tell you what speed training I will do in order to improve my average pace in this blog. My evaluation run last Monday officially started my training program for my 2014 Ultra Racing Season. I suggest you can do this evaluation run if you want to know where you want to start to make yourself run faster, whether in trails or in road. So, lace up, get out of the door, and run! Great post, this is definitely something I will try for my triathlon training when I am next down at the track, How would I determine my target pace for an interval session after the Evaluation Run? i would simply look at the tabulated suggested interval, tempo and easy pace in Jack Daniel’s Training Program or on Hansons Marathon Method’s Speed and Strength Workouts and target increment of 10 seconds faster from my present average pace in 1K or 1 mile or 800 meters. Thank You for the quick reply. I will start trying this out straight away hopefully I can get my times down a few minutes with this method. thanks for dropping by. all the best!